Updated May 2018. Positano and the Amalfi Coast had rain forecast but after four beautiful sunny days in Rome we were remaining positive. As it was the forecasters were right and it did rain, but the sun did shine a little also. The Amalfi Coast of Italy is gorgeous and Positano is quite possibly the most beautiful town of them all. 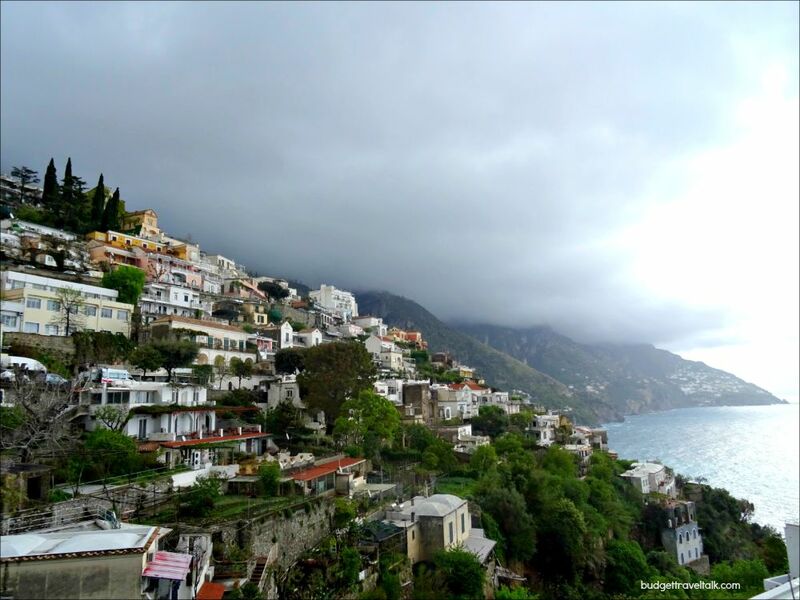 This post is helpful whatever the weather but in particular it suggests things to do in Positano when it rains. 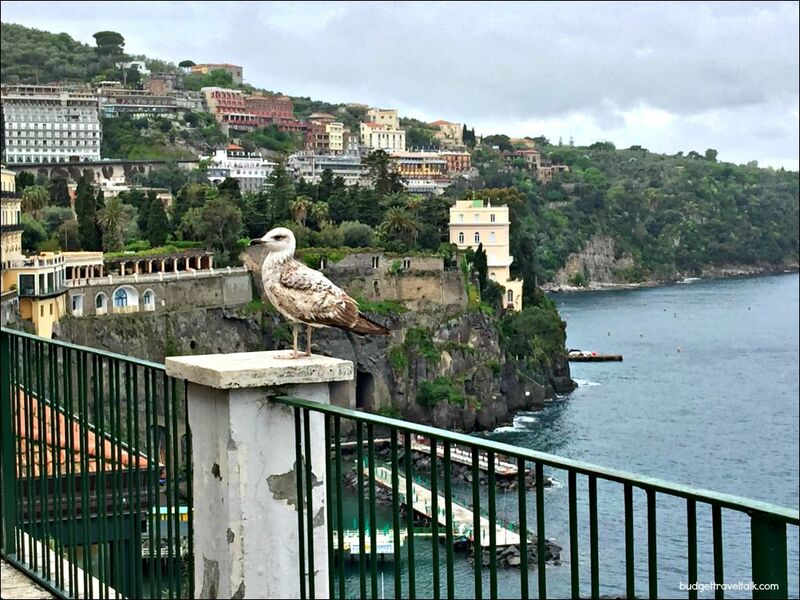 Day 1 Positano – a smattering of blue and an ominous forecast for two days of rain. 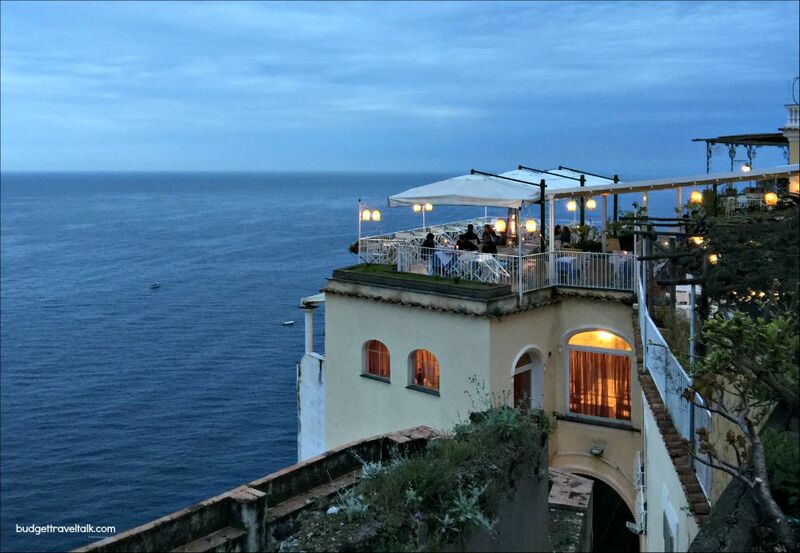 Dine out when it rains in Positano. 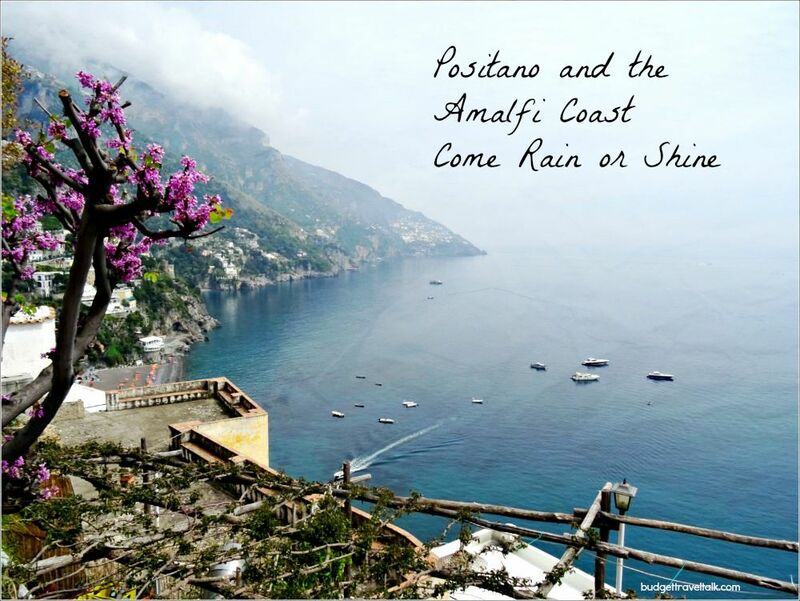 Ride the Sita Bus to Amalfi Town and Ravello in the rain. 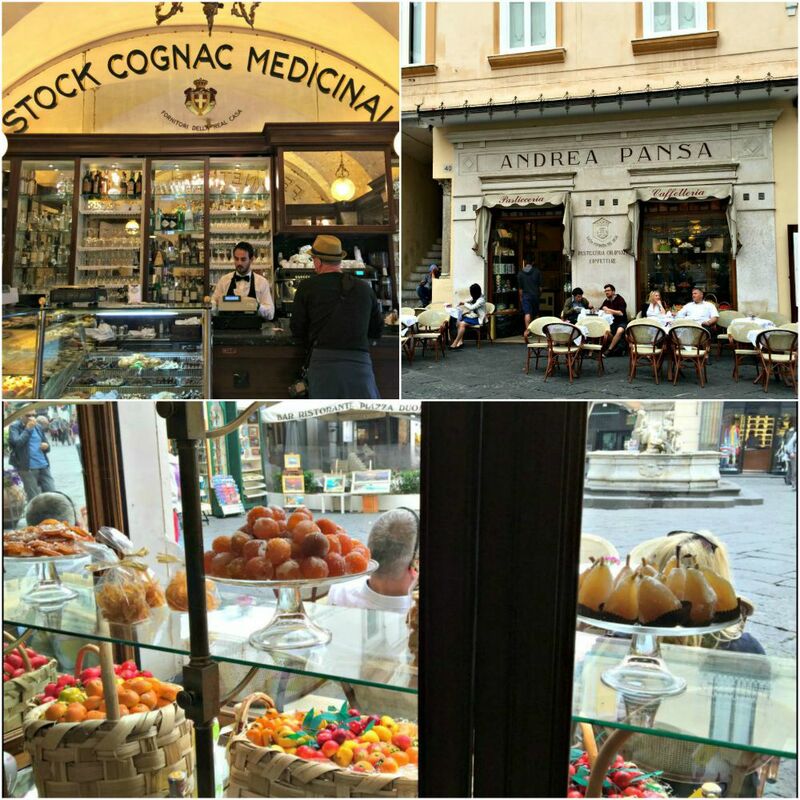 Drink Coffee at the bar of Andrea Pansa in Amalfi Town since 1830. In April 2010 we walked the coastal path that links the five villages of that other iconic Italian coast, the Cinque Terre. The temperature was perfect, skies clear, water blue and unruffled, and the track was challenging but beautiful. It could not have been better – except – later I regretted not seeing those cliff-hanging villages from the ocean. Now was my chance to not make the same mistake on the Amalfi Coast. Trenitalia trains run from Rome to Salerno via Naples. You needn’t leave the train in Naples. Salerno, nicely placed for us to continue on to Sicily after the Amalfi Coast. From Salerno we could get to Positano by boat! 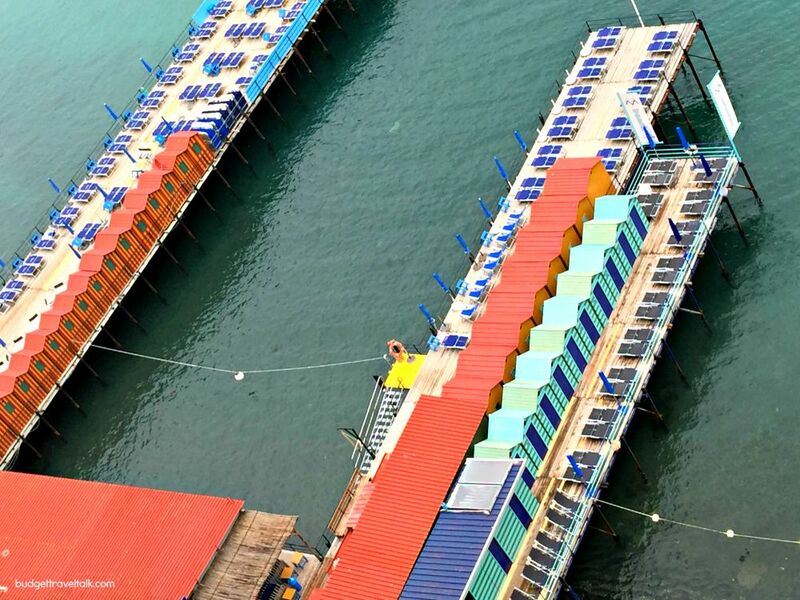 Concordia dock, the Amalfi Coast terminal in Salerno, is a fast 10 minutes walk from the train station. Once on the dock there is a long straight walk to the ticket office and as we rushed toward it, the time of departure came and went – but the ticket office could see us coming and held the boat. How nice was that! The views of the coast would have been better without the haze, but were still quite special. On a clear blue day they would have been magnifico. 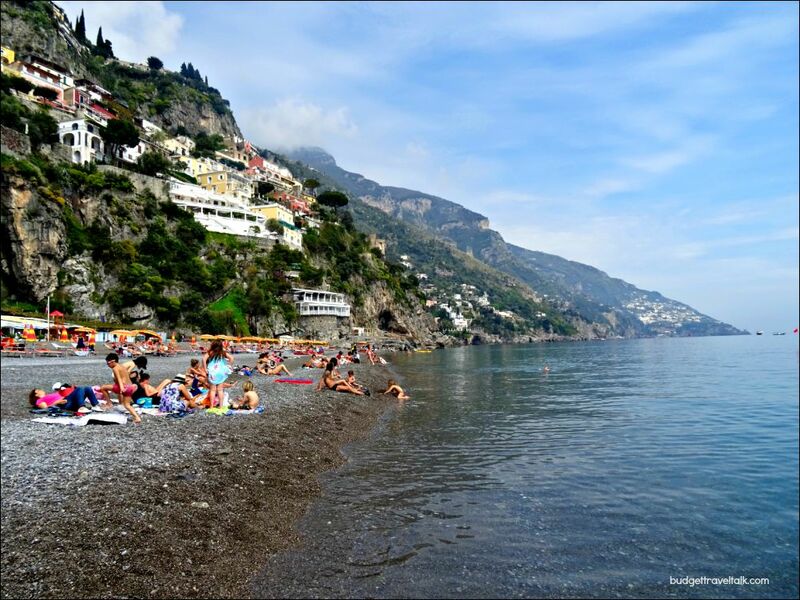 Positano’s main beach – Marina Grande – looking in the direction of Amalfi Town. Swimming in Positano is one of those fun things to do when it rains. I mean you’re going to get wet anyway! The dome of the Santa Maria Assunta church can be seen from the beach and was the first thing I noticed as the boat arrived at the harbour. It is made of maiolica, a tin glazed ceramic tile first made between the 14th to 16th century in Italy. Tin glazing produces a brilliant white surface onto which “stories” are painted. The church holds another wonder, namely the painting called the Black Madonna. The 13th Century stolen Byzantine painting was in the hold of a Saracen ship that was caught in a storm off the coast. The terrified sailors heard the words Posa Posa meaning lay it down being spoken. Thinking it was the Black Madonna speaking, they quickly landed and carried her into the village, whereby the storm ceased. 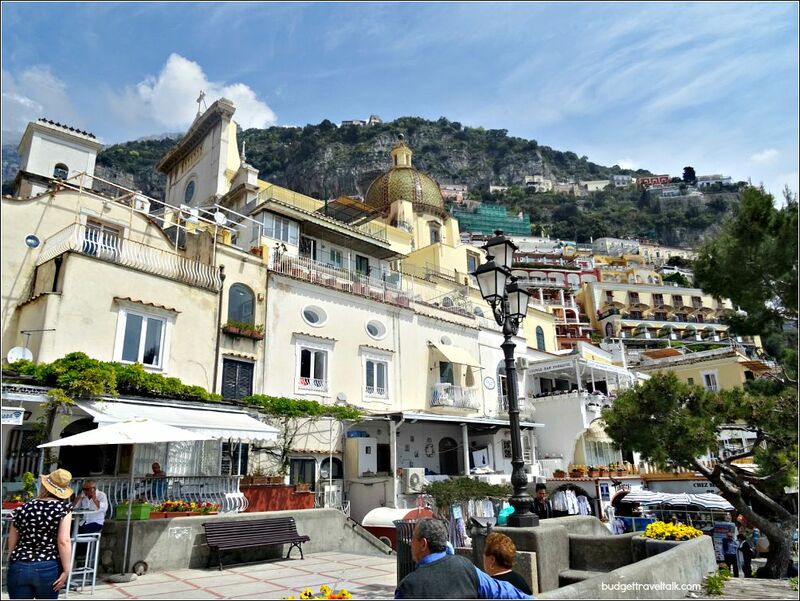 From the word Posa Posa the village became known as Positano. Interestingly there is a Positano Hotel called Posa Posa. These boys made use of some hard to find flat ground. View from the scenic cliff path connecting Positano to Fornillo Beach. Continuing in this direction would eventually lead to the Sorrentine Peninsula, Isle of Capri and Sorrento. Boat trips are a great way of enjoying some Positano Attractions – like arriving at a restaurant from the sea and for photographing the vertiginous and colourful houses. In Peak Season Fornillo Beach is sought by people looking for a quieter option to Marina Grande. Our accommodation, B & B Venus Inn was positioned above this beach and could be reached by stairs on the far side of the beachfront Hotel Pupetto Ristorante (see below photograph) or by road from Positano Harbour. On this occasion we chose the stairs and it was a challenging climb. 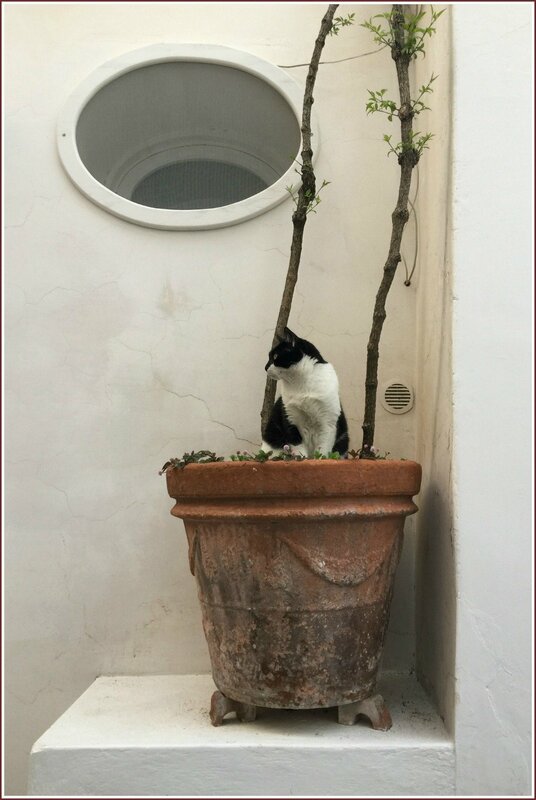 Pot Plant cat in the astmospheric alley that led to B & B Venus Inn. In Summer Fornillo beach is taken up with rows of sun lounges and umbrellas. 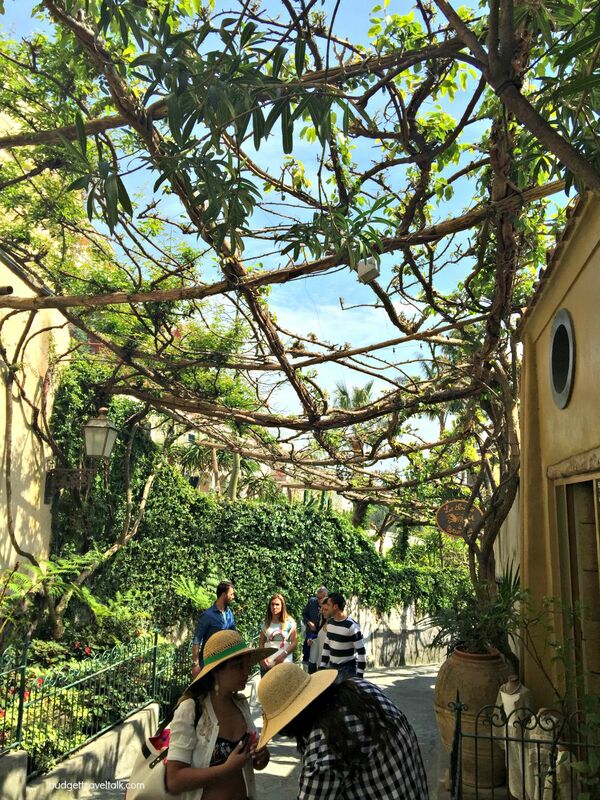 Strolling along the vine covered lane that climbs the hill from Positano harbour can be a romantic pursuit, but on occasion (like the day we arrived) the people were packed in like anchovies! 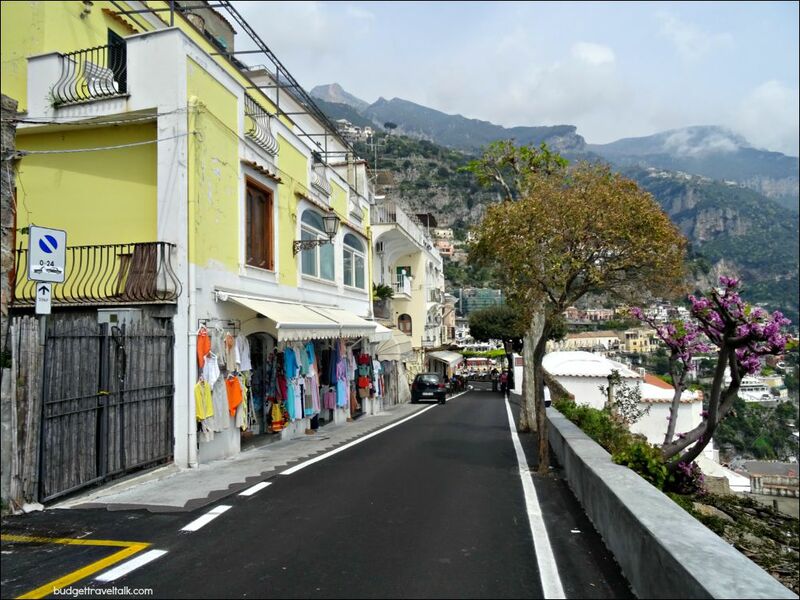 The road leading from Positano Harbour to Fornillo Grotto and Venus Inn. We did not eat at Ristorante Il Capitano, but dining in such a romantic location is what Positano is all about. We devoured pizzas shortly after arrival on our first day and that night we returned for Frutti di Mare Risotto. Both meals were delicious. It is situated near Il Fornillo bus stop, the same stop for our accommodation. Another great restaurant for any weather, but in particular it has an indoor cave like room, decorated with copper pots that is very atmospheric. Specialising in delicious Amalfi Coast pasta dishes. Positano Amalfi Coast Map showing restaurants, bars, ferry terminal, parking. The further away from the beach the more peaceful Positano becomes. 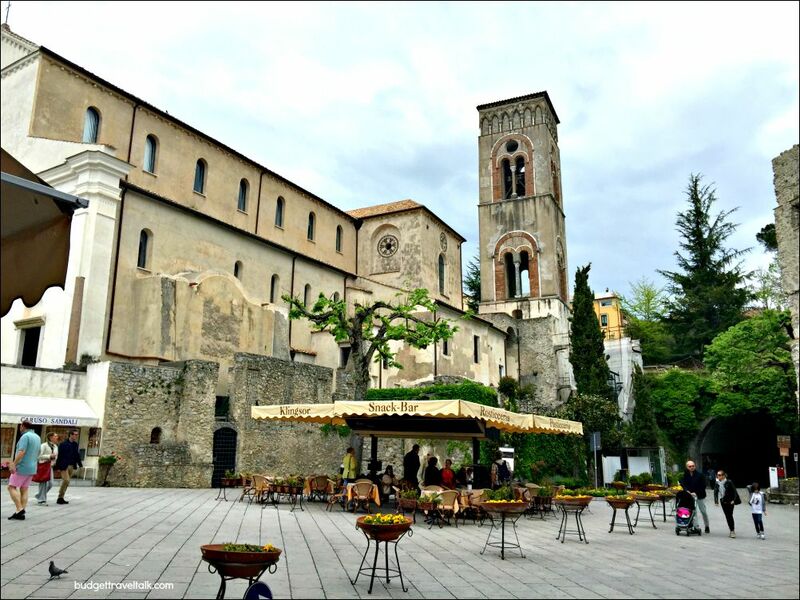 Our host, Gippy, offered one piece of advice – Visit Ravello – which in reality translated to Visit Amalfi Town and then Ravello. It didn’t start raining heavily until we were in the bus on the way home, but both towns are doable in the rain. Whenever there was a shower we just popped under cover or into a shop. The stretch of road between Positano and Amalfi town is the most entertaining bus ride on the coast. Grab the front seat for an adrenalin charged, memorable ride. Even in the rain it is exciting – maybe even more so! Think narrow roads, sheer drop offs and amazing views. On numerous occasions drivers returned to move parked cars, lines of moving cars reversed and once our driver even left the bus and physically moved a parked scooter, to enable us to pass. I left the coast with a deep respect for the skills of the Sita bus drivers. It was a fun roller-coaster of a ride although in Summer the bus might get extremely crowded. The Positano Interno bus drops passengers on the high road where the Sita Bus stops but we walked from Venus Inn. It is worth remembering that Amalfi Town can be reached by boat from Positano but when it rains the boats are often cancelled. The Ravello bus departs close-by the Amalfi Town Marina. Amalfi Town bus depot can be seen between the end of the spit and the town. It is possible to purchase tickets on the bus but pre-purchasing is cheaper. 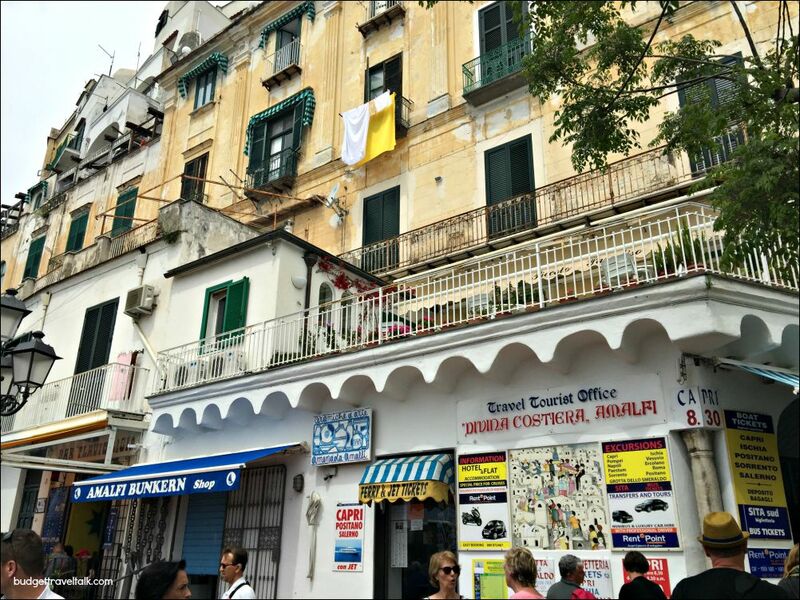 Try a Bar or Tabacchi shop near any bus stop, or the tourist office at Amalfi Town (pictured below). Across the road, near the Amalfi bus depot, are the waterfront boat ticket offices. There is a question I ask wherever we go – of an Airbnb host, a person in the street, or a tourist office – where can we find the best coffee? It can be difficult to get an answer. Sometimes recommendations are not allowed, or favourites are closely guarded, but in Amalfi Town the answer came straight back at me like an arrow. Andrea Pansa has a huge reputation. Even standing at the bar our coffees were expensive (by Italian standards), but they were good and take a look at the goodies in the window. Did I mention the pastries are divine? Now you can get just as good coffee at other cafes it’s true, but Andrea Pansa is the real deal and situated right near the Duomo and opposite the fountain meeting place. When the weather is challenging being easy to find has it’s own appeal. Am I right? Andrea Pansa opened the Cafe in 1830 and it is a recognised Historical Premises. The interior of the store is amazing, making it a great place to stand at the bar and appreciate the atmosphere. If the weather is fine, then people watching from the outside tables is even better. Nearby Andrea Pansa is Piazza del Duomo which contains the Cathedral dedicated to St. Andrew (987). But there is more than just the Cathedral. Next to it is an older basilica (prior to 833) that was built on the ruins of a previous temple and is today a museum. The bell tower (used as a defence during war time) was finished in 1276, while the 1206 crypt was built to house some of the remains of St. Andrew the Apostle. The Cloister of Paradise was added in 1266. The striped portico section was added in 1891 after the previous one collapsed. The front doors of the church (seen below) were the first medieval bronze doors in Italy. The church was closed when we were there. Set aside an hour to view the whole complex including the Cloister of Paradise, Museum (in the old church), Duomo and Crypt (Entrance Fee applicable). 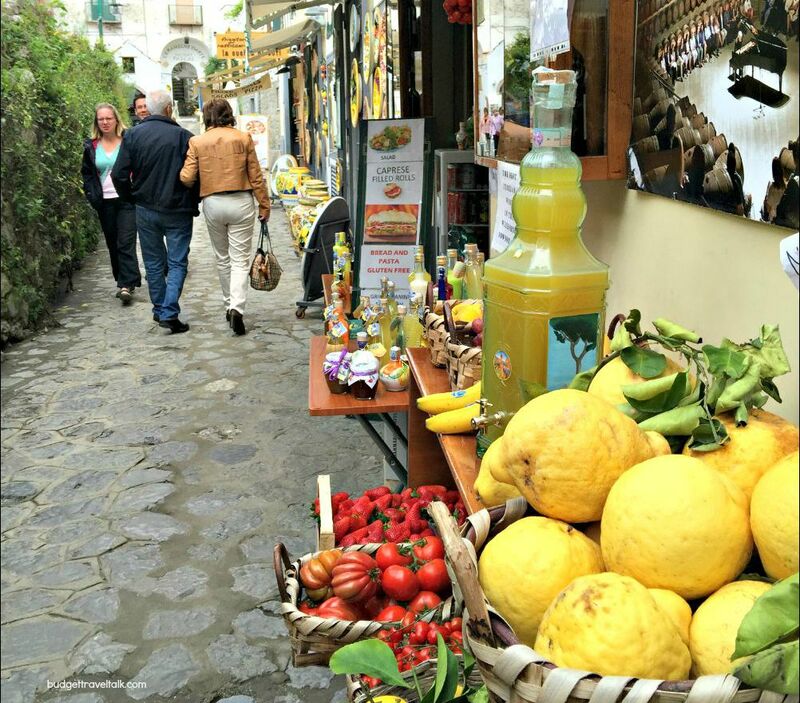 The Amalfi Coast is known for lemons, limoncello, and ceramics with a lemon flavour. Ravello is the place to look for hand-painted ceramics – I especially liked the red Saracen pieces. Shipping home can be arranged. This means it has ceramic shops to linger in and all kinds of souvenir shops. When the rain stops, explore the Villas Cimbrone and Rufolo gardens. But after lunch we were so entranced wandering the lanes with their unexpected views, gardens and garden restaurants that we didn’t visit the Villas. We scampered back to the bus stop with it’s amazing ocean views – yes Ravello is a hilltop town – to wait for the bus back to Amalfi town. 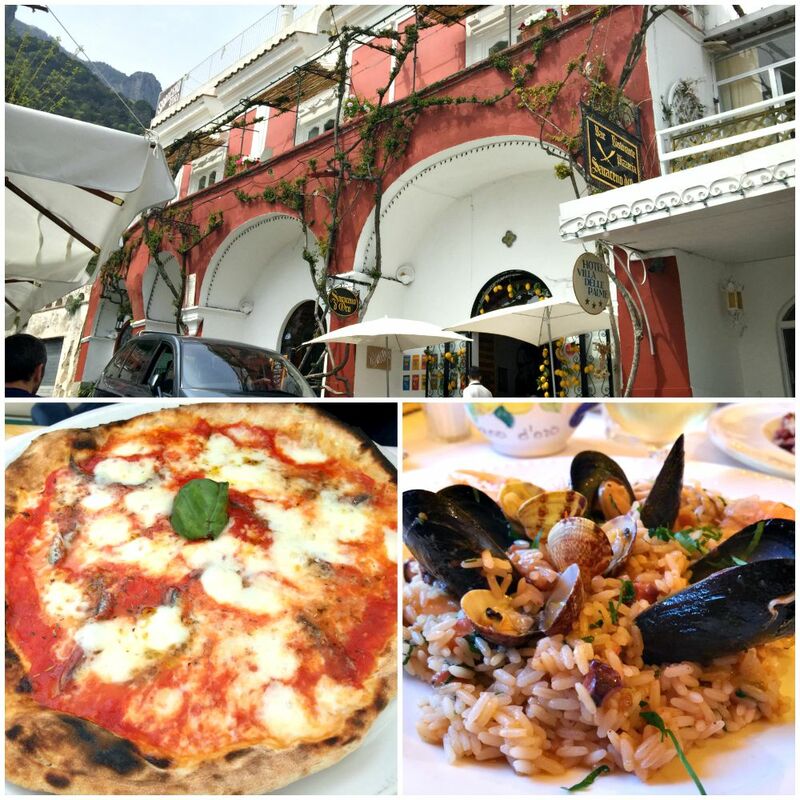 There are many beautiful restaurants in Ravello and a visit here is surely one of the best things to do on the Amalfi Coast. The threatened rain finally arrived. Heavy clouds hung over the hills on our last full day on the Amalfi Coast. Gippy who had remained upbeat about weather prospects the day before, admitted it didn’t look like a good day for Positano. Positano is hilly with narrow lanes not conducive to sheltering beneath umbrellas and jostling for space in the rain. If you are lucky to have a view from your hotel you could do worse than to snuggle up with a coffee or a wine and enjoy the view. If the temperature is not too cold, splashing in the water with other happy holiday makers, rain or not, has it’s charms. Venus Inn B&B Positano Center. 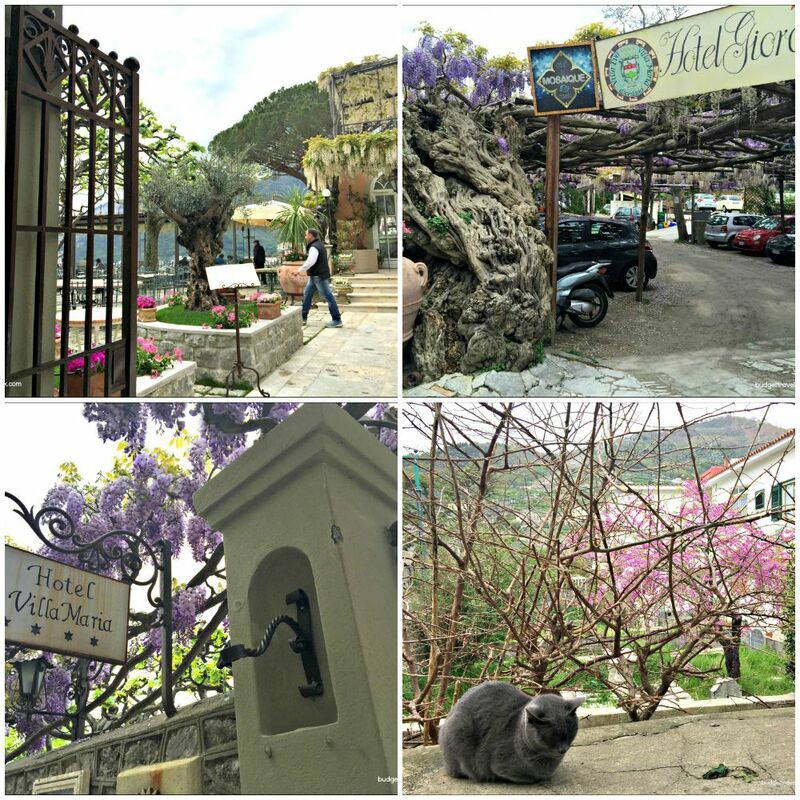 Gippy’s Place was our answer to where to stay on the Amalfi Coast on a Budget. Positano is one of the best and most popular places to stay on the coast so it is expensive, but at Venus Inn we had a nice room with our own shower which opened on the balcony and this view. 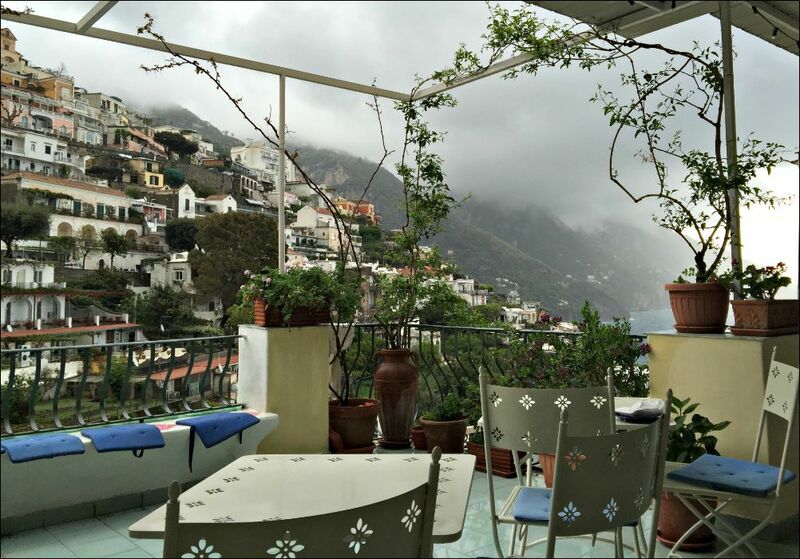 Balcony rainy day view from our Airbnb Amalfi Coast – Positano. 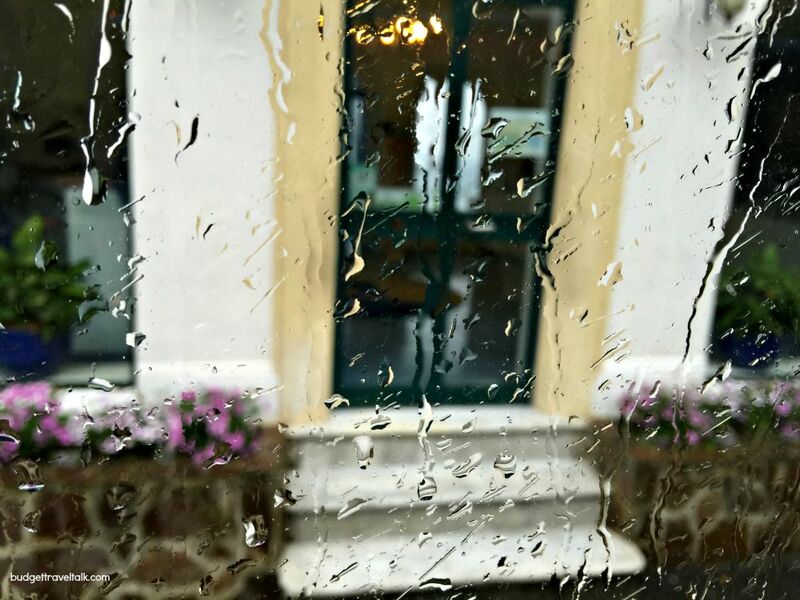 We decided on another bus trip, this time to Sorrento – in the rain. Sorrento is positioned on the northern side of the Sorrentine Peninsula in the Bay of Naples, while Positano and the Amalfi Coast are on the southern side of the peninsula in the Bay of Salerno. It is a is split-level town, with the shopping district in the upper town and the port, Marina Piccola tucked away at the bottom of the sea cliffs. 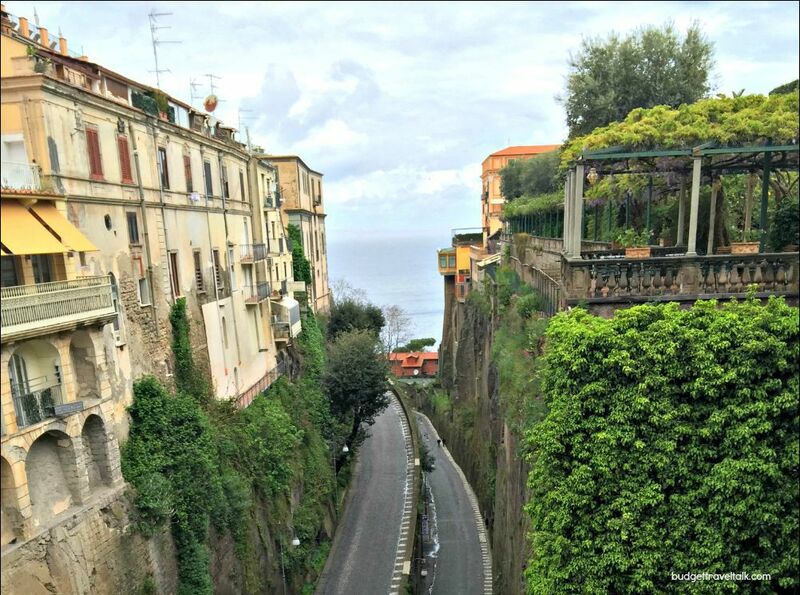 Sorrento is a much bigger town than Positano, Amalfi town, Ravello or any of the Amalfi Coast towns. 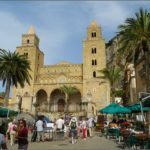 It has busy streets and cute lanes overflowing with souvenir shops, cafes, restaurants, bars and speciality shops selling wine, gelato, chocolate and kitchen ware. Look for the shops selling Intarsia, the wood inlay work that Sorrento is famous for – you may see the craftsman at work – or visit the Intarsia Museum, Bottega della Tarsia Lignea. With just one umbrella between two, it was quite easy (and fun) to run from awning to awning without getting too wet. The shops were interesting and not tacky and we collected quite a few souvenirs. As far as things to do in Positano when it rains goes, catching a bus to Sorrento is a pretty good option. View of the switchback port road taken from Piazza Tasso in the upper town. 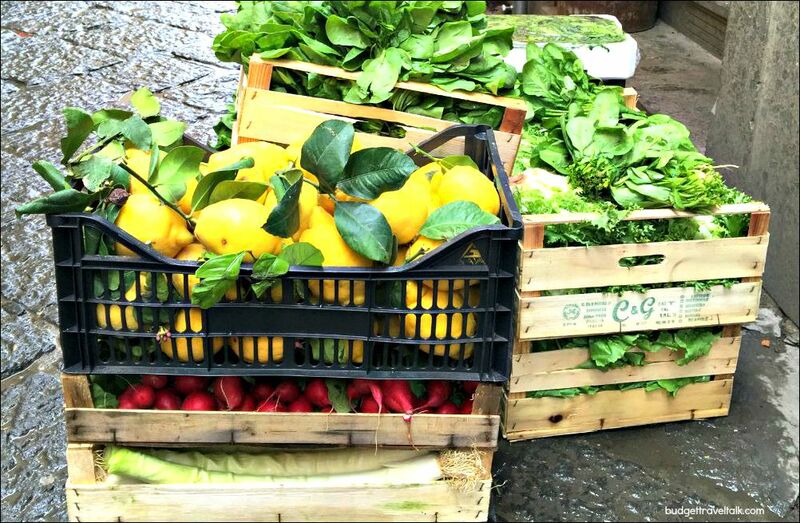 A Sorrento restaurant takes delivery of the daily vegetables – washed by nature. 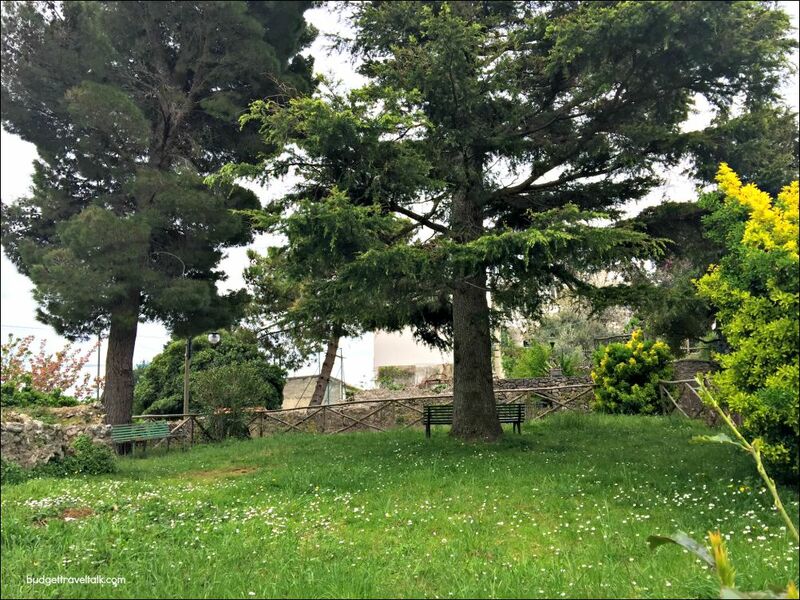 The cliffside park, Villa Communale boasts views over the Bay of Naples and elevator and walkway access to the lower town. Peering over the edge of the cliff revealed bathing platforms covered in gaily painted changing pavilions. 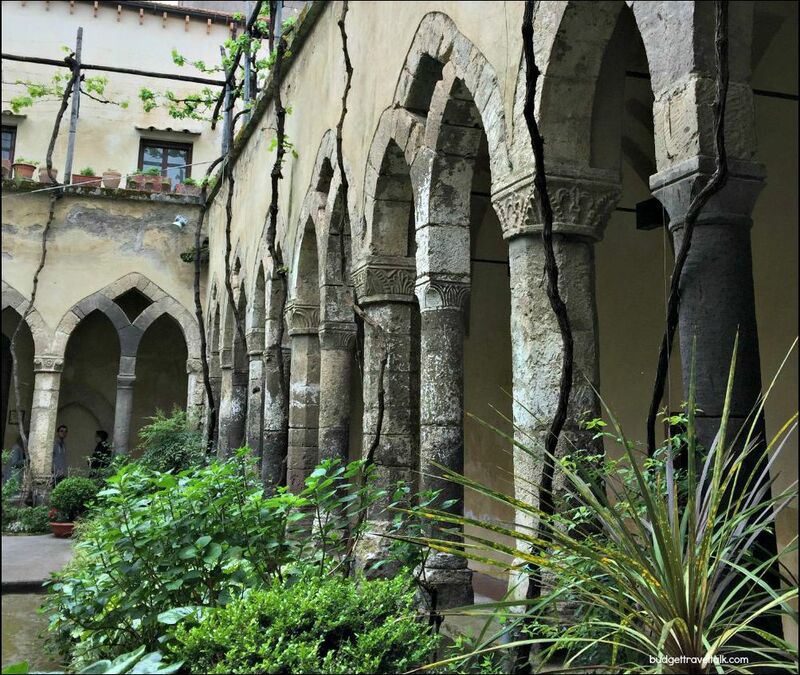 The Cloister of St. Francis is entered from Villa Communale and is used as an exhibition and performance venue. 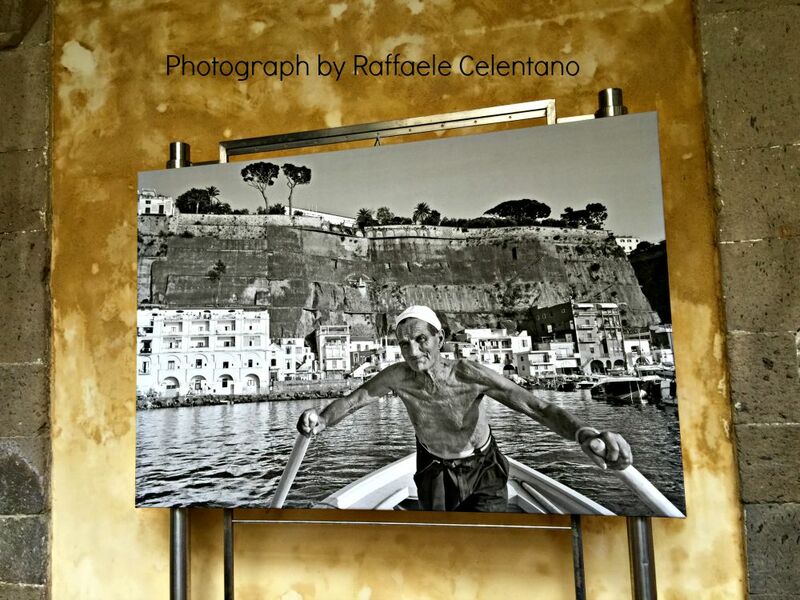 We were very impressed by the photographic exhibition titled “Memories in the Wind” by Raffaele Celentano. It is a beautiful place to shelter and the second floor has fantastic views of the Bay of Naples. The Cloister of St. Francis. Piazza Francesco Saverio Gargiulo 8, 80067, Sorrento. There is a permanent exhibition here. Originally built 11th Century, redone in the 15th, the base of the bell tower is from the Roman period and the front doors are from 11th Century from Constantinople (Istanbul). I’d love to hear that story. 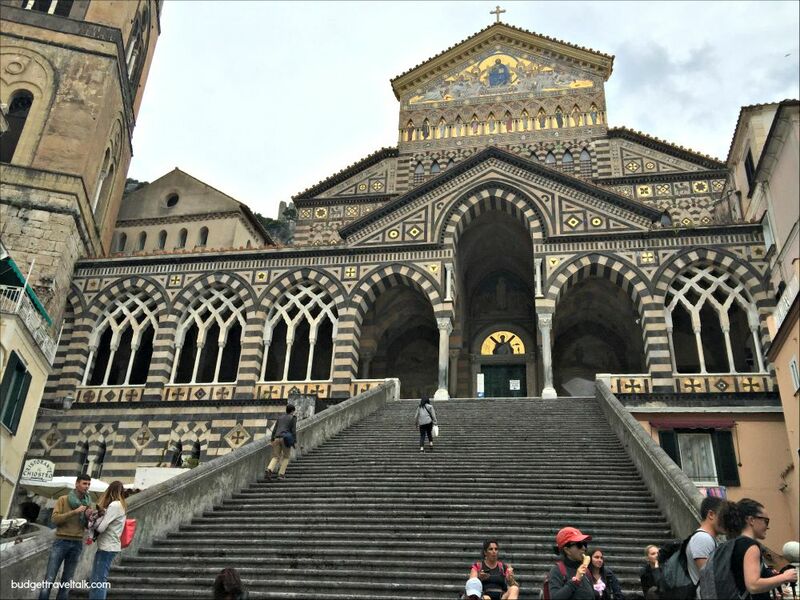 The Duomo has simple and elegant exterior, but inside there are frescoed ceilings, marble columns, timber inlaid wood-work and an intricate nativity scene (year round) behind glass. This is a well-known Neapolitan tradition. Open 8.30 am to 12 noon and 4.30 pm to 8.30 pm. The wood-inlay Museum is situated in a beautiful plum coloured villa in the back streets (Via S. Nicola). Entrance Fee is 8 Euro but well worth it, especially if it’s pouring down outside. A lovely place to wander around and see the works of art made from this intricate method. If you are buying a piece in Sorrento be aware that the cheaper pieces are not made in the traditional manner here in Sorrento. We ended our day in Sorrento sheltering beneath a shared umbrella, in the milling crowd that passed as a bus queue outside Sorrento Train Station. We loved eating in this down to earth Italian Cafe. The food is cheap and good. They also serve coffee and gelato and you can sit inside to eat. Corso Italia 219, 80067, Sorrento. When we finally climbed onboard the bus I had that snug happy feeling that comes from being warm and dry instead of cold and wet. Sorrento was definitely a good choice for our rainy day. Although we coped with one umbrella shared between two, it would be better to have one umbrella per person. You can read about Heading South from Rome here. 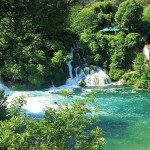 This post is from the Ten Weeks in Europe 2015 series. 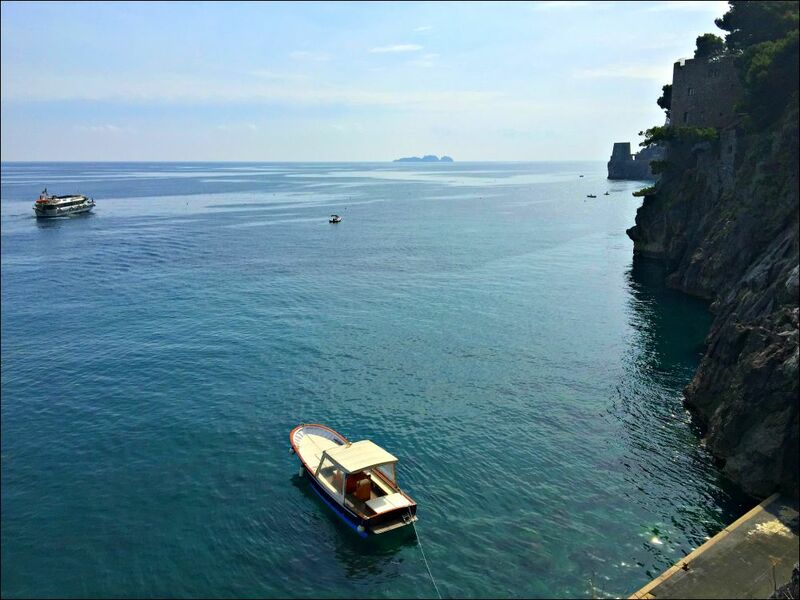 Is Amalfi Coast worth visiting – Yes 100% Yes. 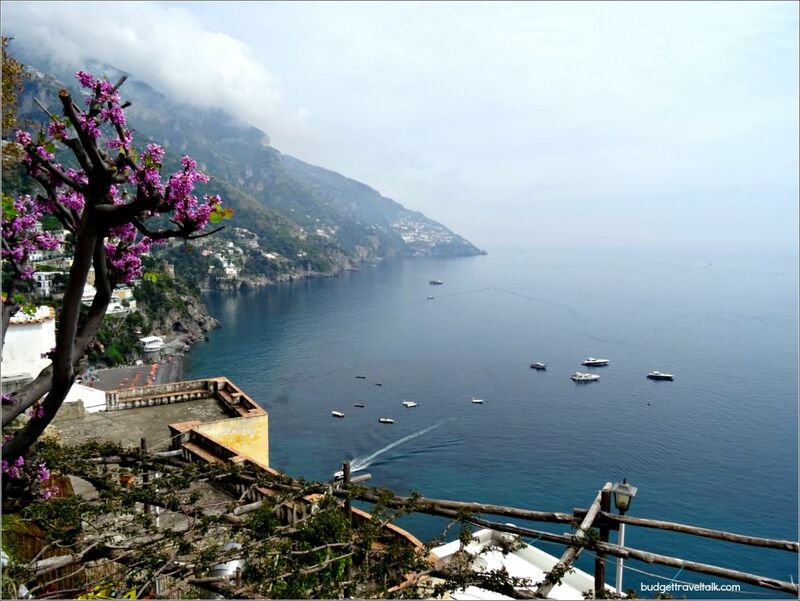 Is it possible to see Amalfi Coast in a day? It is possible to see some of it definitely and some is better than none. How long is the Amalfi Coast drive? Salerno to Sorrento is 56 km. I would not recommend driving along the Amalfi Coast as the traffic is shockingly busy and the road is tiny and very difficult to drive. Amalfi Coast Weather – Weather on the Amalfi Coast forecasts for up to 90 days. 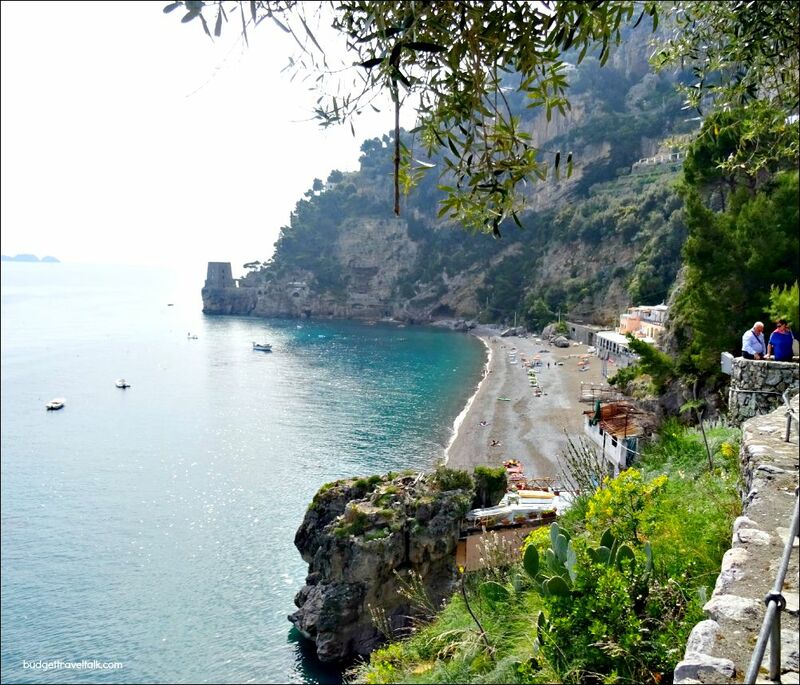 April to June is the best time to go to the Amalfi Coast (wildflowers, mild temperatures and staff refreshed after a winter break). Expect showers in April. The second half of June would be nearly perfect. July and August would be too hot and crowded in my honest opinion. Positano Interno Bus – is a bus that does a continuous loop around Positano. Sita Bus Positano to Amalfi – purchase at any Positano “tabaccherie” or cigarette shops, newspaper stand or bar. There is a bar near the bus stop on Via G Marconi. Read more about the bus service here. 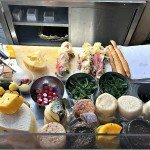 Bar Rita in Sorrento – We enjoyed their great budget lunch options and friendly service. This post is linked to Nancie’s Travel Photo Monday over at Budget Travelers Sandbox. Today I have joined Nancie as a Co-host for Travel Photo Thursday so add your link below and share in the fun. 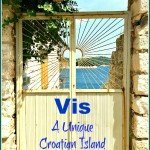 I’ve also linked to Corinne at Reflections Enroute for Weekend Travel Inspiration. 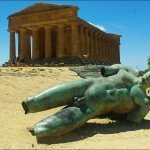 Is the Valley of the Temples at Agrigento Sicily really in a valley? Hi Jan! I’m so glad to have you as a co-host. I love this post. Back in 1971 or 1972 I visited the Isle of Capri on a school cruise. I remember how gorgeous the island was. I don’t remember anything else about the area. Your photos are gorgeous, and I want to try some of the delicious looking pizza. Such an interesting story associated with the Black Madonna and a charming area to explore. Your photos are lovely. Your photos, as always, are spectacular. And this set brought back happy memories of our travels on the Amalfi Coast and Sorrento – it has been far too long since we were there! What absolutely stunning pics!! We’ve not been to Almafi, but it’s on the list! Well, it rained but at least you guys were able to do lots of things. And then, it doesn’t matter if it rains or not to enjoy great food ;0) Love the path covered in branches and twigs. Hi Ruth. We were not disappointed with our weather challenged time on the Amalfi. I liked seeing the flip side to the picture postcard. This was so informative with such beautiful photos! We have decided to go in September next year. 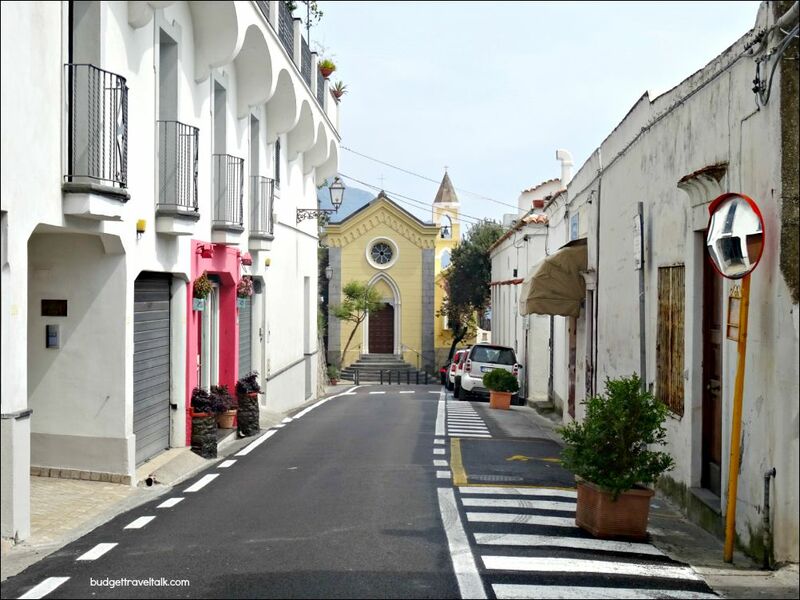 I was invited to see a property in Sorrento and will plan a trip around that. After seeing your photos, I am even more excited! Oooh Suzanne are you thinking of buying a property in Sorrento? I’m glad my post was timely for you! OMG I think I have died and gone to heaven! What an exquisite coastline. I can’t believe the beauty of this place. It is on the bucket list for 2017! You will love it Kathy. The thing is when to visit. Shoulder season means less crowds but probably too cold for swimming. Summer will be hot enough to swim but lots of people! I don’t think swimming is that important seeing we have great swimming at home. What about you? What an amazing post with fabulous photographs. It brings back memories of every movie I’ve ever seen set in Italy. This is now officially on my bucket list. This is such a beautiful part of the world. I remember the shop keepers in Sorrento plying us with limoncello in the morning, and then we thought that the cobble stones were moving after. Your photos are beautiful and bring back many happy memories. Oooh yes, I don’t particularly like it. Tastes like straight lemon cordial to me with a kick of course. We were always given it after a meal (on the house) and I felt like I couldn’t decline it as it was already poured. I started skolling it. Jan, I cannot believe I’ve never been to Cinque Terre. I keep trying to figure out the absolute best time to go. I’m thinking the end of November. Do you think the weather would be good then? Thanks for linking up with #wkendtravelinspiration! Great post…unfortunately you can’t control the weather when traveling but looks like you made the most of your time there! 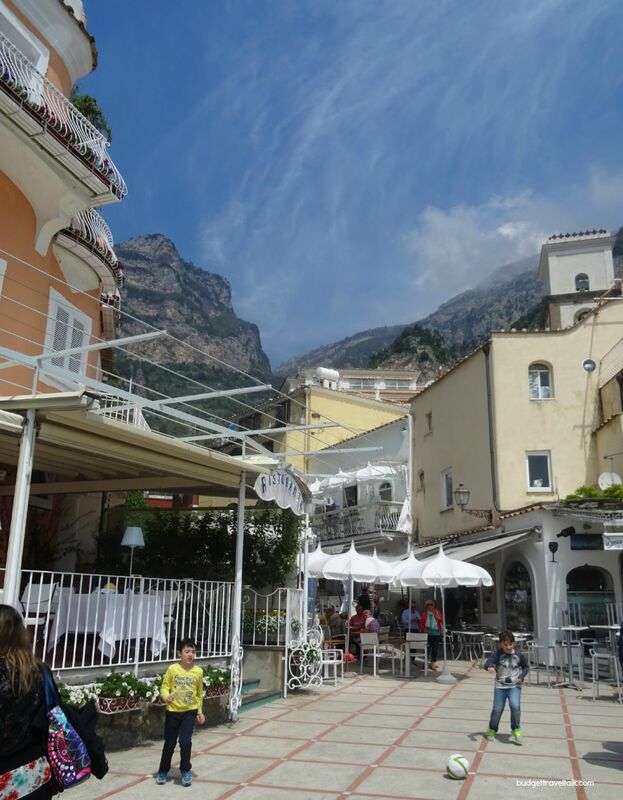 Amalfi Town looks so quaint, we hope to get the opportunity to visit some day. 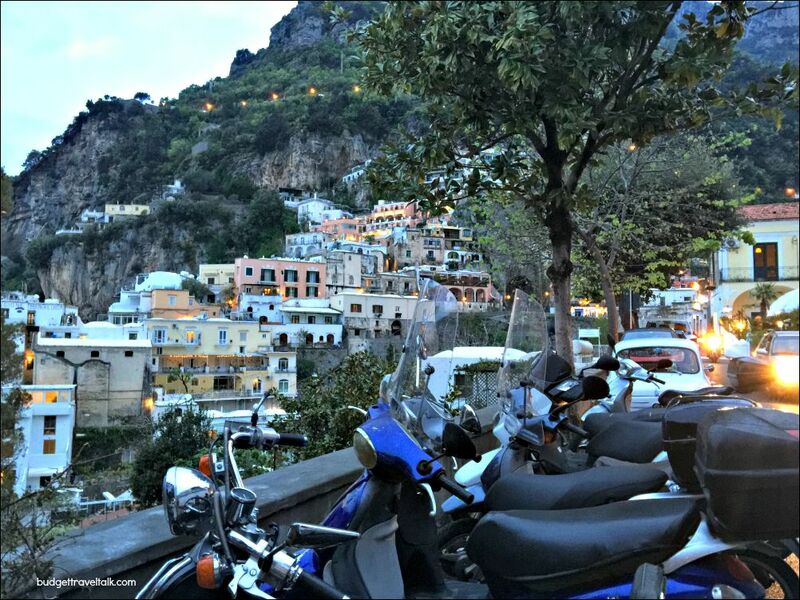 Amalfi town is quite flat – well it slopes gradually, whereas Positano is steep. I think there is a bit of rivalry between the two towns. I thought Amalfi was cheaper foodwise than Positano. This is brilliant, I’m bookmarking it for my trip to the Amalfi Coast in September. I’d heard that car parking was tricky so think we will try to walk when we can! I love that you included pictures of this beautiful strtch of coast line looking up from the beach. It was nice to see some different perspectives of the area. Wow! It’s beautiful even in bad weather. I’ve only ever seen photos of it in the sunshine with the lemon groves etc. Reading about your visit reminds us just how much we love Italy! 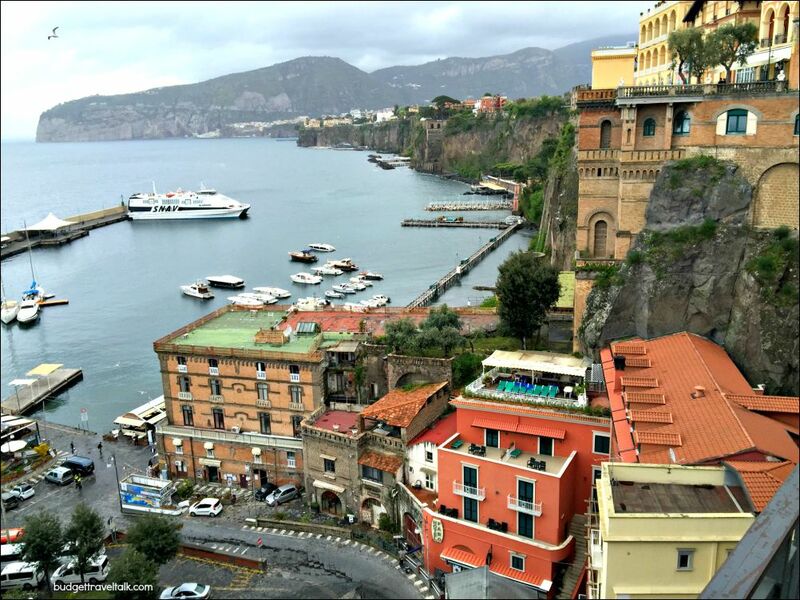 Unfortunately, we haven’t gotten to Amalfi yet, and had too short a time in Sorrento. Just long enough to fall in love with the area. Granted, that doesn’t take long! Thanks for the little tour and great photos! Ah, your comprehensive post and wonderful pictures reminded me of my my visit to Amalfi Coast many years ago. This place is so unbelievably beautiful, it leaves you speechless. There is indeed a lot to see there and just three days were probably just enough to make you want to come back for more. I would like to visit again when the sun was shining. Aww, just spotted this post on your home page and lovely to see all these pics. 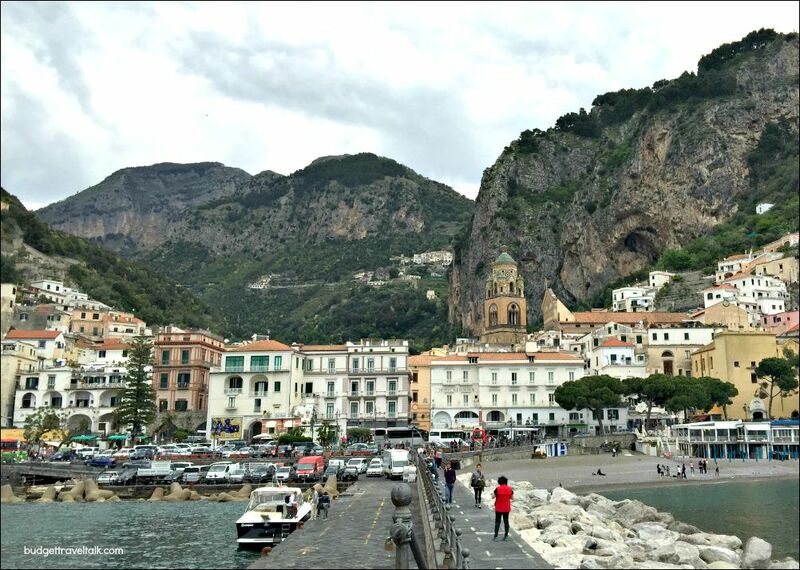 We drove along the Amalfi Coast in June with stops at Amalfi and Ravello (nowhere to park in Positano), after a stopover in Sorrento. The scenery and the atmosphere was just everything we wanted it to be. 🙂 Great memories. Would like to spend longer there. Gosh you were game driving along the coast Julia – I’m impressed! Ravello was gorgeous and parking in Positano horrible! Wow, those photos are calling to me! there is so much to see in Italy and only so much time! Wow! Just gorgeous scenery! 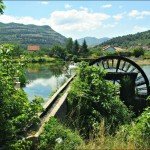 Your pictures are absolutely beautiful and really capture the people, life and culture of this area. This area has been on my travel wish list for a long time. Thanks for the inspiration! One of my favourite areas of Italy. I love staying at Positano and taking the bus to Ravello and then returning by boat. Great idea to see Sorrento and keep dry! Ravello is gorgeous isn’t it and I love any boat trip, especially on the Amalfi Coast.